From the man who captured Charles Manson, Paul Newman, George Lucas, the British royal family, Sean Connery, Alec Baldwin, Ed Koch, Pope John Paul II, Frank Sinatra, Sylvester Stallone, Willie Nelson, Muhammad Ali, Billy Crystal, Ronald Reagan, George Bush, Fidel Castro, Jimmy Carter and John F. Kennedy Neil Leifer has shot more covers for Sports Illustrated, Time and People-over 200-than any other photographer. One of the world's greatest sports photographers, he has photographed 15 Olympic Games, 4 soccer World Cups, 15 Kentucky Derbies, countless World Series games, the first 10 Super Bowls and every important heavyweight title fight since Floyd Patterson beat Ingemar Johansson to regain the title in 1960. But Neil Leifer has also shot some of the most exceptional portraits of celebrities and sport stars ever, from presidents to Hollywood actors to Olympic champions. 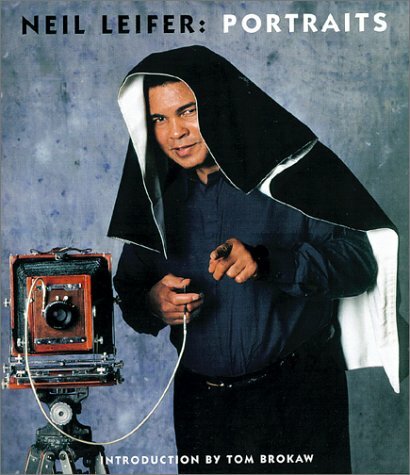 Leifer became a professional photographer while still in his teens. Using the skills he'd learned in the mid-50s on the Lower East Side of Manhattan, at the Henry Street Settlement's photo workshop, he quickly moved from being picture editor at his high-school paper to working as a freelancer for major national magazines, eventually working for nearly all of them, including The Saturday Evening Post, Look, Life, Newsweek, Time, and most often, Sports Illustrated. During various parts of his career, Leifer has been a staff photographer at Sports Illustrated and Time, and a contributing photographer at Life. He now devotes most of his time to producing and directing films. This is his 10th book and the first to be devoted to a wide range of his portraits.